In a non-scientific poll, DailyFinance.com exposed the 15 most annoying sales techniques their readers dislike, proving that the American shopper has not been duped by all of our clever marketing ploys. To regain control, I think that smart shoppers are playing the system with extreme couponing and even charting the retail schedules of most major discounters, pharmacies and supermarkets to know when to buy certain products. There is a plethora of smart shopping sites, price aggregators and consumer reviews. There is a battle going on between retail and shoppers. Those who are winning have established a real relationship with their shopper that transcends some of these tactics. Bulk Buying Required. You know the drill. It’s the supermarket mega $10 sales where you “Buy 10 for $10”. This offer only appeals to those with room for all that pantry and freezer loading. Bulk Buying Suggested. This is basically a signage issue. The product is $1 but the sign says 10 for $10. The savvy shoppers know which stores require larger purchases. For instance, some stores advertising Buy One, Get One Free but will sell one item at half-price. Upsell at the Register. This is the “Do you want to super-size that?” world. Included here is the extended warranty, the store credit card, the loyalty card, and priority seating on airlines. Unfortunately for consumers, the upsell does work and probably won’t go away anytime soon. Bait and Switch. We all know this practice is unacceptable, and if you are doing it, shame on you. I hope all your online consumer reviews are bad. Certainly, in all advertising, it is important to let consumers know if there is limited quantity on offers. Some retailers don’t put a brand name with a product, so they can offer a very similar product at the same price. Fine Print. This annoying habit concerns the disclaimers around offers that are complicated and hard to fulfill. Some of our favorite department stores have exclusions for a wide array of name brands and products. The simpler the offer, the better for both the consumer and the retailer. Rebates. Some advertised prices include a rebate which is never redeemed by the consumer, so unless you have a foolproof way to offer the rebate, get it out of your price. Mispriced Items. Customers think this is a scheme but most retailers will tell you it is just an honest mistake. However, retailers need to have a policy for items that are scanned incorrectly. Item in front of the “sale” tag. This is often a complaint and I think the issue has to do with the limited nature of the offer. Too often, only one flavor, or scent, or line extension causes this confusion. Again, simplicity of offer is the key. Telling You How Much You “Saved”. Okay, loyalty cards do “show” a savings. But savvy shoppers know that only a few shoppers ever pay the non-card price. Have you ever let the person in front of you use your loyalty card because they forgot their own? But, again, loyalty cards are not going away and some actually help and reward the consumer. Putting a Coupon on the Receipt. Another marketing tactic that is here to stay, but it is annoying to some shoppers who don’t want to spend time and gas returning to the store for another purchase. Constantly Rearranging the Shelves. Maybe some retailers do this too often, but I don’t think this is a consumer conspiracy. It may be more of a plannogram issue caused by consumer products. Most retailers will attest to how disruptive a remodel is to their business, as shoppers have to work to find items. 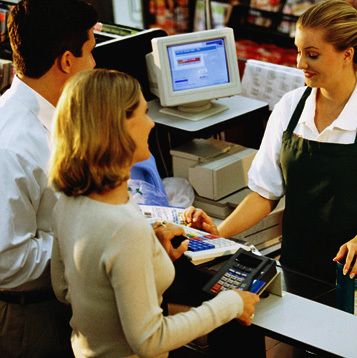 If you are having a big change in your store, make sure you have adequate help to guide shoppers. Cheap Items Are Hardest to Reach. There is definitely a scheme to how shelves and stores are laid out to encourage purchase. But many times, sales items are in plain view on endcaps. Staples Are in the Back. Actually, supermarkets have identified the need to satisfy both the convenience shopper and the weekly pantry filler, and more stores are putting milk and orange juice in coolers closer to the register. Obviously, not all stores have adjusted to this, but I think they will as pharmacies and discounters cut into their business. Putting Items Coveted by Children Near Check0ut. Yep, it’s a problem, but at the same time, it’s a convenience for some shoppers. Promoting Christmas Items Before Thanksgiving. This year some retailers started promoting Black Friday before Halloween, and all retailers have begun some type of holiday promotion. While it is disconcerting, the recession has seemed to escalate this behavior. And many shoppers have responded to it. You are currently reading Marketing to Women: 15 Most Annoying Sales Techniques at The Lipstick Economy.